Years ago, I wrote about the glaring homogeneity in North American birding circles and by glaring, I mean all that bright white skin. The lack of diversity in the ranks of enthusiasts has long been recognized as a deficiency at best and at worst the certain death knell of our nation’s natural resources. After all, if future generations don’t value public parks or conservation measures, they won’t protect essential habitat. Once that happens, we’re all sunk. So certain forward-thinking members of the American birding community have been trying to answer that critical question: how can people of color be encouraged to become birdwatchers? John C. Robinson has probably pondered this dilemma as long as anyone. After all, in nearly 30 years as a birder, biologist, and tour leader, he has traditionally stood out as one of the only black birders in any given group, organization, or even city. 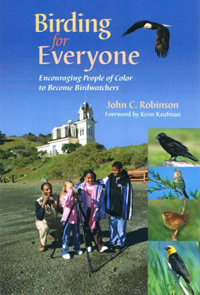 One product of Mr. Robinson’s long-term commitment to this critical issue is his new book, Birding for Everyone, Encouraging People of Color to Become Birdwatchers. While I fervently support the author’s cause, I hate to admit I do not like this book. My first and foremost problem with this book is that it doesn’t appear to know what it wants to be. To remain consistent with its titular mission, it should either be directed at influential agents who might encourage people of color to become birdwatchers OR speak directly to potential birders by promoting the benefits of birdwatching in a relevant and easily accessible manner. The successful accomplishment of either of these ends would require not just laser focus but a tone that would render it unsuitable to the other population. Tragically, Birding for Everyone, Encouraging People of Color to Become Birdwatchers fails to differentiate between potential audiences. The result reads like two different works grafted awkwardly together, a Frankenstein monster likely to frighten off the very villagers it’s come to save. Clearly, Mr. Robinson’s editor did him no favors. It’s a shame too because once you get through the beginning birdwatching tips, you’re confronted with what the author calls the Hard Facts. Demographics may be favorable today for organizations based on outdoor and nature-based recreation, but won’t be tomorrow if the current trends continue. What won’t change is that the populations that currently comprise what we call minorities in America will constitute a majority. What may change if all goes well is the level of engagement these populations, particularly blacks and Hispanics, have with nature. The hope that individuals without a cultural foundation supportive of outdoor activities like birdwatching may be brought into the fold in numbers that might make a difference is presented as the raison d’etre for this book. But it fails to go beyond generalizations to deliver specific action steps. Part of the problem lies in the limitations of what is presented as research. A survey of 322 North American birders is followed by a survey of 357 African Americans which then leads, in the Expanding the Research chapter, to twelve interviews. Now, I’m not one to dwell on the sample size of a test population if valuable information can be derived from the research. But while twelve might make for a decent dinner party, it hardly constitutes a statistically viable sample. We meet some genuinely interesting men and women in the roughly 25% of the book devoted to recounting these interviews yet that magical moment that connects anecdote to incontrovertible action never comes. This is perhaps my biggest disappointment with John Robinson’s book. I read it cover to cover looking for an answer that never came, at least not in the form I anticipated. My expectation was that in publishing this book, Mr. Robinson was announcing he had cracked the code, that he had definitive advice on how to enourage people of color to become birdwatchers. Yet I didn’t get any more from this book than I did from Mr. Robinson’s article in the Nov/Dec 2008 edition of Birding magazine. If anything, the closest we get to a systematic industry response to the issue is six succinct pages of industry action steps by the estimable Paul J. Baicich. This book is not a solution but simply a step towards one. I still support John C. Robinson in his quest to bring birding to everyone. In fact, I think he will be, as he undoubtedly has already been, one of the most influential agents of positive change in the future demographic distribution of American nature lovers. If purchasing a copy of Birding for Everyone, Encouraging People of Color to Become Birdwatchers will move us closer as a society to greater diversity in birding, I’ll recommend that you buy two. However, what I’d rather do is wait for Mr. Robinson’s next book in the hopes that it will fulfill the promise this one only hints at. I haven’t read the book, and so can’t comment on either it or the review. However, the near total absence of people of color in birding has long been a source of great unease with me. I would like to report, though, that competing in this year’s World Series of Birding (the 25th!) was an African-American team, an event first. A sign of changes to come? We must all fervently hope so, for the stakes, as Mike points out, are literally critical. Nice post, it actually prompted me to go back and read your 2005 “homogeneity in birding” post. One thing I’ve wondered, what does the birding community look like in other predominantly-white countries? Anyone have stats, or general impressions, from Great Britain, for example? I’m not sure what I’m getting at, but probably something near, is this disparity a uniquely American issue, birding in general, or what? Obviously, solutions won’t come until we identify the roadblocks. I have been a birder all my life and as a black man I used to get a lot of stick mostly from other black people (strangely) but I also suffered an element of racism. I don’t think that racism exists now as much as it did when I was a boy, though I still think that having an interest in wildlife carries a stigma for young kids of all colours and creeds. My theory is that it is less of a race thing now and more of a ‘city’ thing. People are disconnected from nature and kids would rather be playing computer games etc that be outside exploring a wood. I wrote a piece on this very subject a year ago for Bird Watching Magazine (a PDF is viewable on my website http://www.theurbanbirder.com) which roused a lot of comment at the time. This is a very interesting subject that deserves a forum for discussion. Thank you Charlie for your kind comments. I hope I’m not hijacking the thread, but you’ve touched on something that’s of great concern to me. As well as racial and geographical disconnects, we face a generational disconnect as well, or “nature defecit,” as has been discussed here before. As a kid, I caught frogs for a living, once the maddening interuption of school had been dispensed with. Today, my nephew and his friends spend ALL of their time on computers. Not a frog or microscope or chemistry set in sight. This is in the same town I grew up in, and this is ONE generation removed. It becomes far more crucial now that we try to get others, ALL others, across racial, geographical, and generational divides, interested in the natural world, and, perhaps most importantly, we need to convey how much FUN this stuff is. As has been said, you don’t protect what you don’t love, and you don’t love what you don’t know. We’re on the verge of raising one of the most ecologically unconcerned generations ever, the “green” fad notwithstanding, and this ignorance can only multiply exponentially as time moves on. Thanks for letting me rant. Now, back to our regularly scheduled programming. Hey Mike, I came here by way of the Book review blog. I am also a member of NBN (but I admit until now, I hadn’t visited your page…big mistake I now admit.) But this topic drew me in. After all, I blog about similar issues – diversity, ahem, the lack of diversity in nature enjoyment, outdoor recreation, and evironmental appreciation. My blog is designed to be an introduction to the outdoors, especially to other people of color. I’d like to see more faces that look like mine – mixed in with all of the other pretty colors, too. I will at least check the book out. I am eager to see it for myself. @Louis: Have you read the book? What part, exactly, did you find to be overtly racist? No one I know who actually read the book came to the conclusion that anything resembling racism is advocated in the book so I must conclude that you are speaking from ignorance.